Many people commonly have more than one mobile device. With ActiveSync for MDaemon, any user can have multiple devices of any make/model on a single account, making it easy to sync all your MDaemon email, calendar, contacts, and tasks. 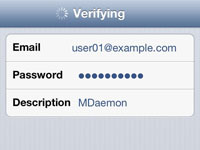 ActiveSync for MDaemon uses Push email technology that provides an always-on capability, in which new email is actively transferred (pushed) to the device after it is received by the MDaemon mail server. 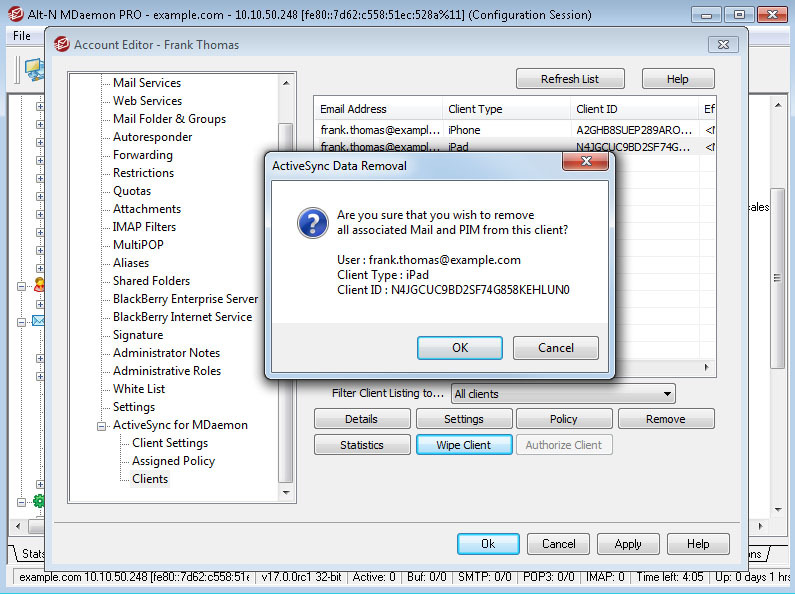 *Note: Not all ActiveSync devices recognize or apply policy consistently. Some may ignore policy altogether and others may require a device reboot before changes take effect (defeating the purpose of many of the policy elements). Also, no policy is applied until the next time the device connects on its own to the ActiveSync server. If a device is lost or stolen, the MDaemon administrator can use the Wipe command to erase all data on the device, or restore the device to its factory default state. 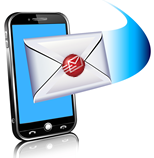 Autodiscover (or Auto Detect) Service: A user can easily create an account on their mobile device by entering their email and password. They do not need to know their server name to setup the email service. 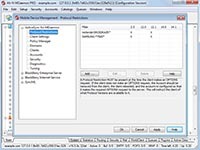 The feature facilitates the discovery of core account configuration information by using the user's SMTP address as the primary input, which significantly simplifies the configuration of mobile devices. ActiveSync bundles all sync requests together instead of doing a sync for each folder separately, so battery life and data won't be consumed constantly and there's far lower message delivery latency. Global Address List (GAL), also known as Global Address Book, contains contact info and other resources associated with a contact to enable your MDaemon users to look up your other MDaemon users' contact info. Short for Secure Sockets Layer, it's used for transmitting private data securly. SSL uses a cryptographic system that uses two keys to encrypt data - a public key known to everyone and a private or secret key known only to the recipient of the message. 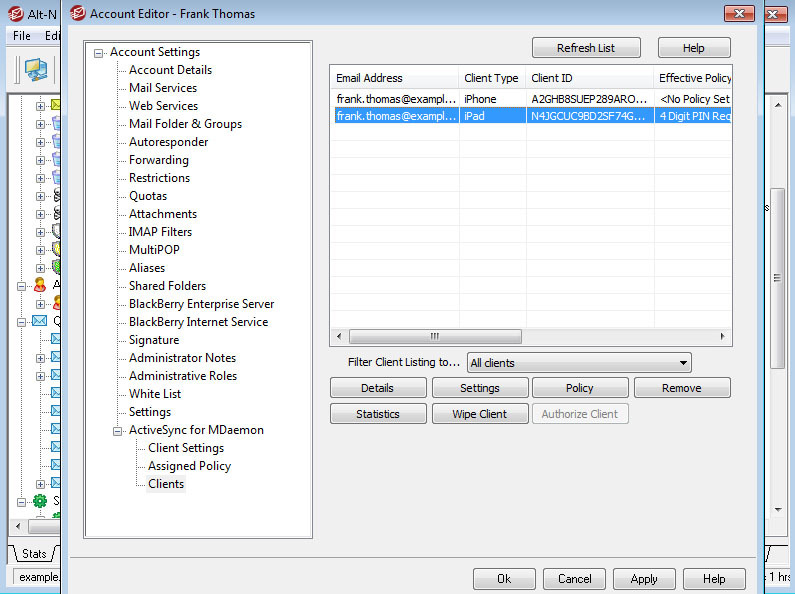 ActiveSync for MDaemon uses SSL encrypted transmissions to send all of its data between MDaemon mail server and your mobile devices. 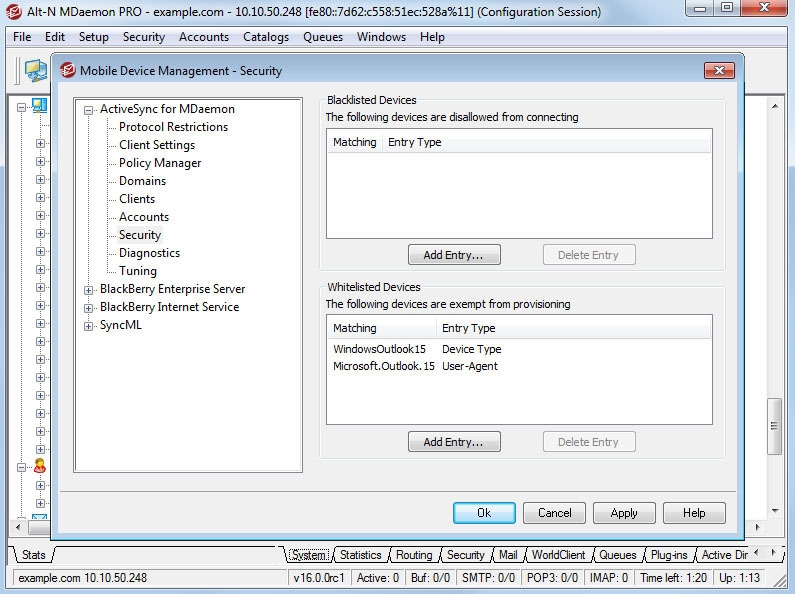 ActiveSync supports a device ID, device type, and device OS whitelist and blacklist. You can whitelist or blacklist devices based on their ID, type, and OS values. The ActiveSync Options screen will let you specify the number of days of inactivity after which MDaemon will forget about a particular device. This setting defaults to 31 days. 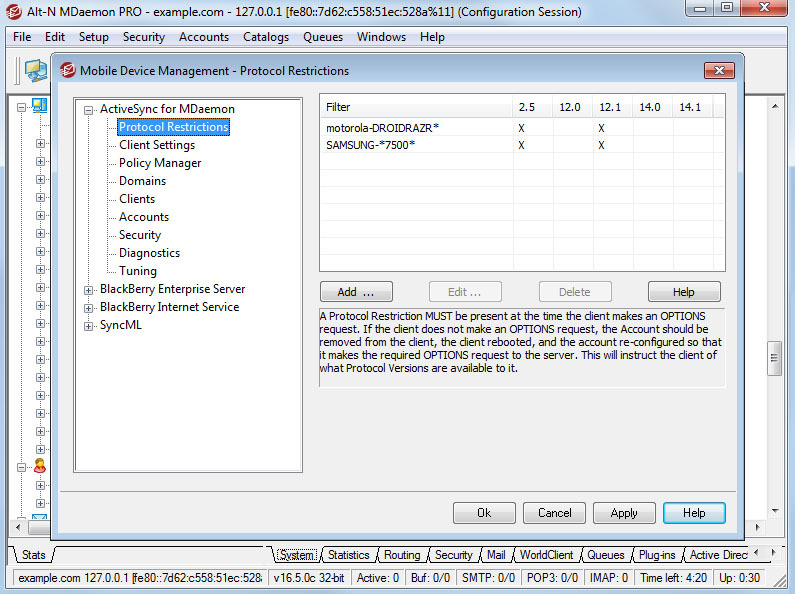 When MDaemon forgets a device, it means that any previous configuration and/or access history is discarded. The next time the device connects it will be forced to re-provision if a policy is in place at the domain level, perform an initial folder sync, and re-sync all subscribed folders. This helps to keep your installation clean from having a lot of old/retired/ unused devices. As part of the daily cleanup event, MDaemon will check all devices for inactivity. 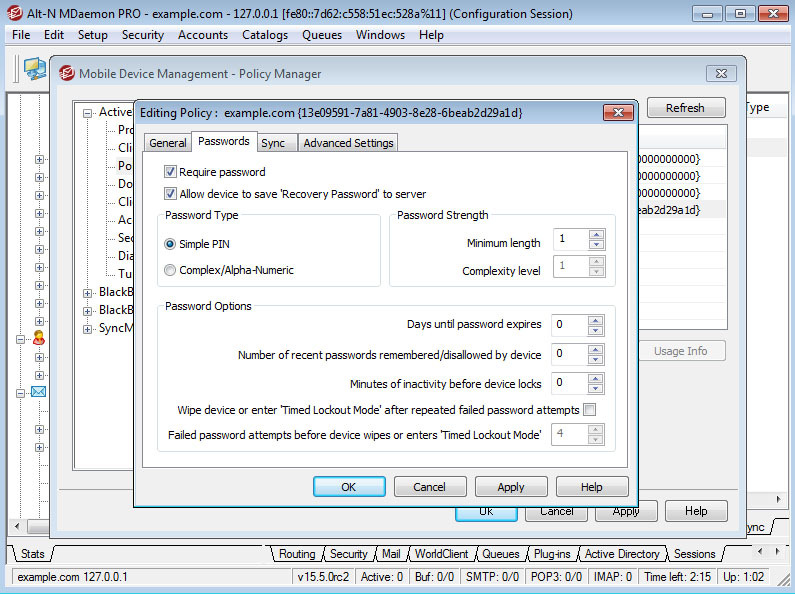 The Restrictions screen lets you specify User Agent and Device Type values and restrict devices matching those values to one or more specific versions of ActiveSync (choose from 2.5, 12.1, 14.0, and 14.1 Protocols). The ActiveSync server will communicate with matching devices using only the selected protocol version(s). ActiveSync for MDaemon installs along with MDaemon but it is a separate product from MDaemon and will only run as a trial for 30 days. After that, a fee is required. The trial begins when you install MDaemon and enable ActiveSync for the first time. 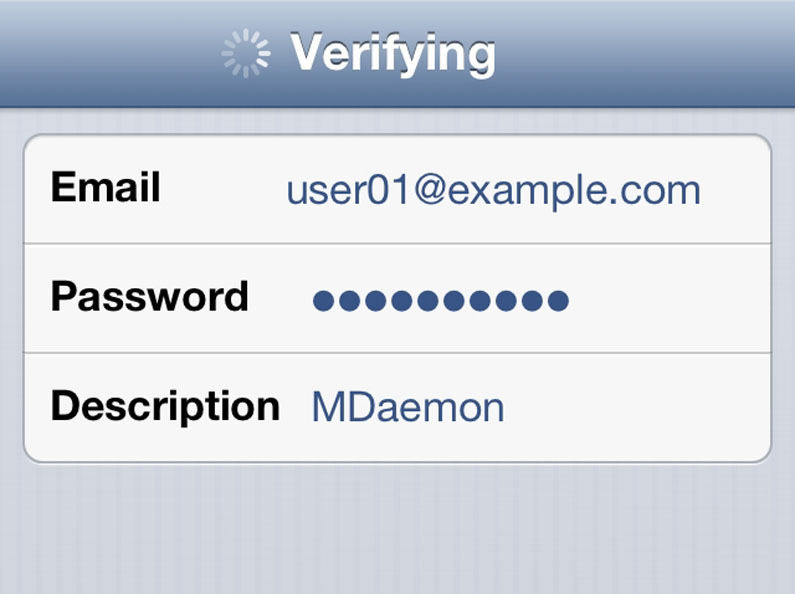 *ActiveSync does not work with MDaemon Lite version.